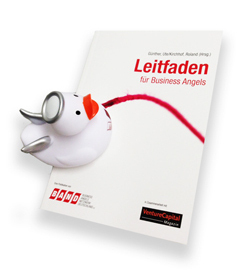 Guide for Business Angels | Business Angels Netzwerk Deutschland e.V. 75 authors point the way to Angel Investment: precise, short and practical. With this guide for Business Angels BAND enters new territory because there is until now not a comparable work on the German market. Almost 20 years after the term Business Angel has established itself in Germany, it was time to publish a book that summarizes the experience of the Business Angel practice. all those who want to know what is hidden behind the term „Business Angel”. Both market experts and newcomers gain valuable information and a comprehensive overview of all facets of the market – directly from practice. Using case studies, the activity of Business Angels are explained. Even experienced investors find in practical technical contributions suggestions for further professionalization. Founders who are looking for Business Angels capital and management know-how, learn what Business Angels are looking for. As varied and diverse as the Business Angels scene are also the authors. In addition to practice experienced Angels many representatives of outstanding law firms and consulting companies were won to report from their daily work. The positions are not always congruent but that’s it what makes the charms of the book. The large and spontaneous willingness of so many authors to support the book shows that in Germany a lot of know-how is available.